What Types of Squash are Safe For Pets? 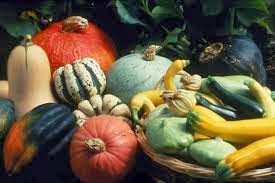 Both summer and winter squash offer great nutritional value for cats and dogs. Summer squash, such as Zucchini and Yellow Crookneck, are low in calories (which can help keep off the extra pounds) and are a good source of calcium, potassium, beta-carotene, and folate. Cats are more particular in their tastes and tend to prefer winter squash. A small amount of pureed pumpkin or butternut squash such as 1/2 teaspoon mixed into a cat's meal can provide valuable nutrients. Winter squash, such as Butternut, Spaghetti, or Acorn, are a great source of vitamin A, vitamin C, potassium, dietary fiber and manganese. They also contains folate, omega 3 fatty acids, and B vitamins. Cats will sometimes eat pumpkin and butternut squash in small amounts, if it is mixed into their food. The fiber can help relieve constipation and diarrhea as it helps to regulate the natural wave action of the intestines. Adding fresh, frozen, cooked or squash puree into your dog's regular diet, can improve the overall nutritional content of your pet's diet and help them feel more satiated.